Do you ever pick up ugly stuff at the thrift shop knowing that it has possibilities? I do. Like these vintage Enesco hand painted, framed tiles of wild fowl. Hand painted white tiles with pheasants and geese mounted on green felt and framed in dinged up, ugly wood frames. I paid $2 for the pair. They still had their Enesco, made in Japan stickers on the backs. Our master bedroom is decorated with vintage wildlife and fishing items. My husband is also a collector. 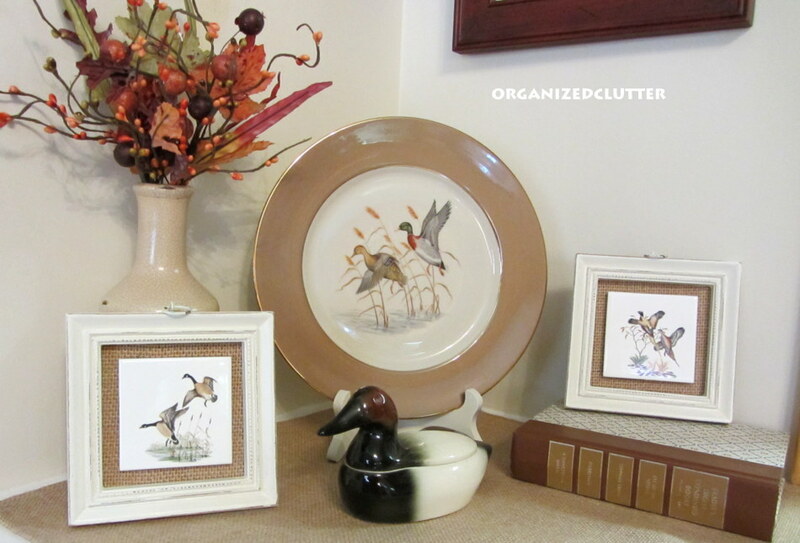 He collects vintage fishing rods, lures, and reels, and also duck decoys and vintage wildlife figurines. I really don't mind a wildlife bedroom because I have my collections displayed in pretty much every other room of the house. 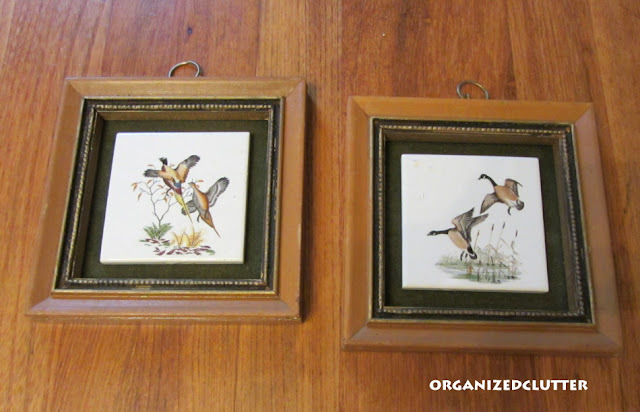 I first took the old pictures apart and got rid of the green felt, and painted the frames with Rustoleum Heirloom White. I pried the tiles off of the thin board backing and mod podged a scrap of burlap to the back board. 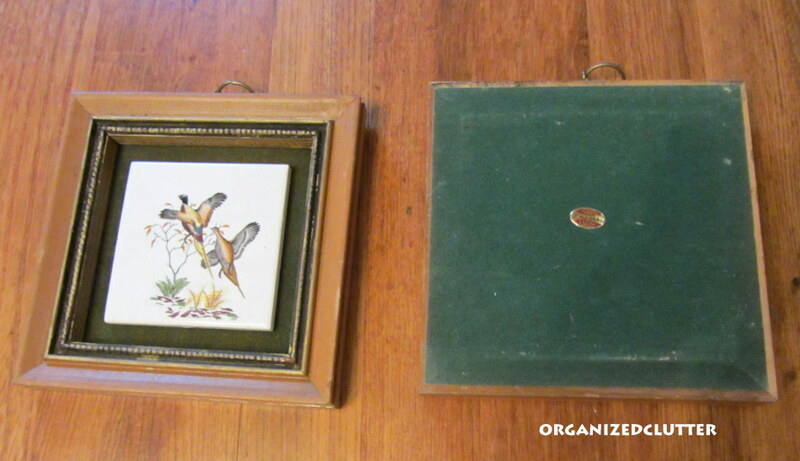 I distressed the frames lightly and put the pictures back together. I hot glued the tiles to the burlap, cut up a brown paper bag for squares to neatly finish the backs of the pictures. I like the way they turned out. 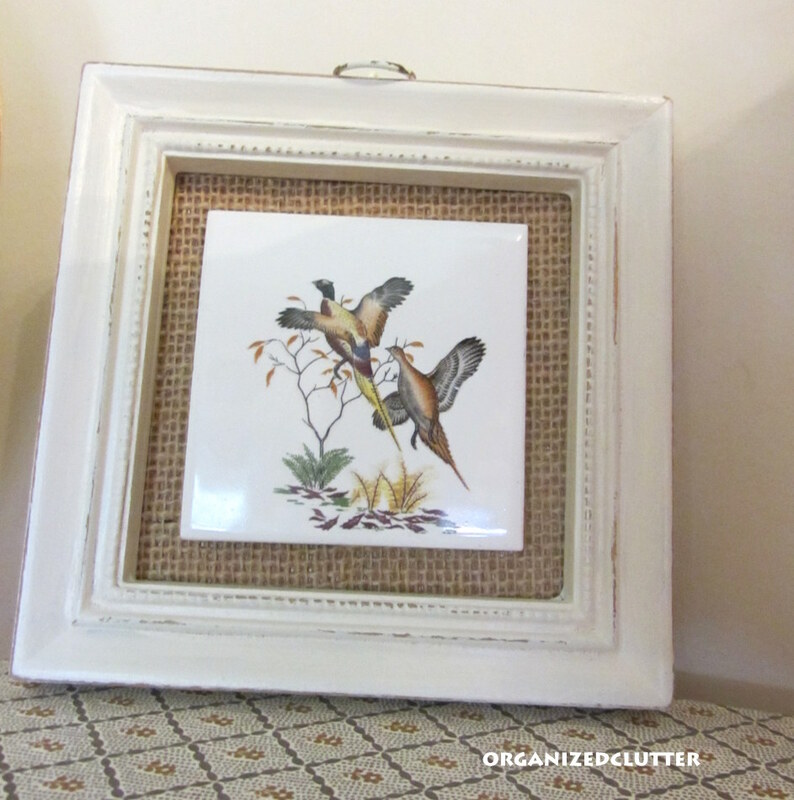 I had the burlap, paint, mod podge, and glues already (and used very little), so I have new decor for $2. Does your husband have Ducks Unlimited prints. We have several and would like to sell some. My husband used to have them in his office. I like how you reframed the prints. Wow you did a really great job on repurposing those...they turned out fantastic. Your transformation is wonderful, Carlene! You had a vision of what could be and executed it perfectly. I like how they turned out too. 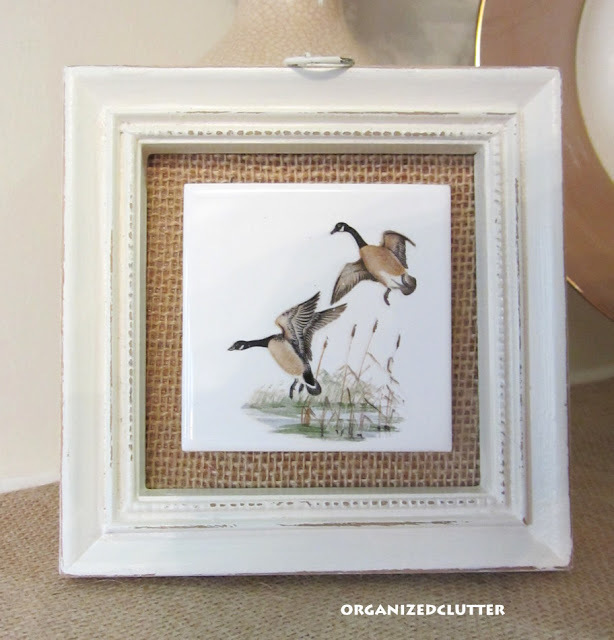 I love the new white frames and burlap, adds such a "newer" look without losing the charm. Thanks for sharing your inspiration with Sunday’s Best – you helped make the party a success! I like how they turned out too! They look fabulous and for $2, too! Great makeover. I love how they turned out...great makeover!! So much prettier in white! Those look wonderful! I probably would have walked right past those, but you really made them look great!